Time for the rest of the list – here are my top 8 albums of 2016! If you haven’t yet seen my choices for #16-9, you can find Part 1 of my albums list here. For the most part, you’ll have to find your own way to listen to the albums – most of them are available on all the major streaming services – but in case you’re new to the artist, I’ll post at least one video link from a track on the album. Enjoy, and feel free to share your thoughts in the comments below or on twitter @DaniceCarlson. Happy Holidays! Many of us Chance the Rapper fans have been following this long-time Chicago collaborator (formerly NoName Gypsy) for a while now, so when news came of her debut LP, it took me exactly zero minutes to download Telefone. And it’s even better than I imagined it could be. Not only does she show up with what she does best – a gentle flow of honest and poetic wordplay – but she brings in other Chicagoan artists, like Saba and Eryn Allen Kane, for some help with hooks. This album feels like a graceful and deeply mature version of adolescence, still holding on to childhood but constantly hit with daily doses of tragic reality, all in the localized context of her unsafe yet “happy” city of Chicago. My only complaint is that at 33 minutes Telefone is entirely too short, but I usually just end up listening to it twice in a row. It’s hard for me to pick a highlight, but if I had to I would say the tracks “Yesterday,” “Reality Check,” and “Shadow Man.” You can listen to the whole thing for free below via Soundcloud. Having fallen deeply in love with Bon Iver’s first two albums, I was nervous about 22, A Million – especially when they released the tracklist that featured a little more math than I feel comfortable with. It strays sonically from what I’ve come to expect from the band, but since my very first listen I’ve been absolutely mesmerized. Like Radiohead, what manages to remain in Bon Iver’s ever shifting and evolving music is an atmosphere that accesses emotional language beyond words. It seems that as Justin Vernon experiments more and more with heavily filtered and produced sounds, his own voice ironically becomes clearer and more easily understood. So although this album is more electronic and even, at times, robotic, the songs themselves never lose a sense of human intimacy… which is exactly why I would like to make another comparison to Radiohead, but I’ll let you make that connection on your own. The opening/title-ish track “22 (OVER S∞∞N)” seems especially relevant at the moment, and with a perfectly fitting sample taken from Mahalia Jackson’s “How I Got Over,” it holds on to some hope at the beginning of the record. My other choice tracks include “8 (Circle),” – which sounds a bit more like something from their self-titled album – and “33 “God”,” which is embedded below in a video of the live release. Before moving on to the top 5, I just want to say that this is the most ridiculous top 5 I can ever remember. #5-2 were some of the hardest spots to settle on, and for a while I considered making a 4-way tie. Seriously, so good. Ok, now that you’re a bit more prepared for how great I think these albums are… on with the list! Musically, conceptually, and as a package, A Seat at the Table is flawless. The scaled back production leaves room for the light piano and nearly counter-melodic bass lines, creating what sounds like conversation between the instrumentation and Solange’s soft yet powerful vocals. I have trouble remembering a time when I so loved the use of interludes, in which she uses personal and generational voices (such as her parents, and No Limit label founder, Master P) to delve deeper into a broader experience of being black in America. Each interlude has echoes and hints of songs to come, allowing for smooth transitions between dialogue and melodies. Without question, “Cranes in they Sky” and “Where Do We Go” are two of my favourite songs of not only the album, but the year. Solange sings of strategies and questions that are both timeless and particularly pertinent, and offers songs as signs of healing and possibility without an ounce of naiveté, making ASATT one of the most hopeful collections of the year. If you are not yet a Chance fan, I simply don’t know what to say to you. It seems like every time he puts out a new single, I forget about everything else that’s out there. His rhymes are clever and playful and full of joyful energy. Chance has managed to do what only Kanye has come close to doing – he has married hip hop and gospel music in a believable way that stops just short of preaching. Praising, sure, but it’s hard to sound judgmental when you take a “Smoke Break.” The Kanye and Kirk Franklin featuring opener, “All We Got,” is like part 2 of The Life of Pablo’s “Ultralight Beam,” similarly bringing the choirs together, literally and metaphorically, to begin the album. Sometimes I imagine it’s like the start of a hip hop pageant – you can hear a delightful chaos of all the participants warming up their instruments and finding their way to their rightful places in the church. Then suddenly, the album is off with a bang, and while it takes some time for wistful reflection (on “Summer friends”), it’s an animated celebration of life and creativity, bringing in a whole team Chicago collaborators, BJ the Chicago Kid, Jamila Woods, NoName, Saba, and even the Chicago Children’s Choir. He released one of my favourite tracks, “Angels,” early, and it made my songs list of 2015, so that is obviously still a highlight, but I would add “Same Drugs,” with its extended Peter Pan imagery around growing up and apart, and the closer, “Finish Line/Drown.” “How Great,” and even “Blessings,” are nearly too much for this semi-post-evangelical, but both tracks have verses that are pure FIRE. Oh, and “All Night” has been my favourite non-Beyoncé track to spin at any and every party I’ve thrown this year. Jamila Woods’ debut solo LP is phenomenal. Lyrically she shows off her skills as a poet and a spoken word artist, but the music never sounds like an afterthought. Woods defies genre, playing with folk, hip hop, hymns, r&b and lullabies to create a sense of childhood and nostalgia for everyone, even quoting Paula Cole’s Dawson Creek theme song on “Lonely, Lonely.” Like Solange’s ASATT, HEAVN makes use of the interlude/skit in really effective ways; they mostly consist of black women leaving voice recordings talking about their experiences. One of these interludes describes how black children playing outside is proof of the resilience of black people, and it’s hard not to hear that as the underlying theme and image of the entirety of HEAVN. It seems so fitting that Woods played a grandmotherly voice on Chance’s “Sunday Candy,” because on every track she says pointed and difficult wise words like only a grandmother can get away with. Also, like Chance and NoName, Jamila is deeply rooted in the city of Chicago, and regularly reflects on how her hometown has shaped her, not willing to give up any memories, no matter how painful. Speaking of memories, there is plenty of tribute on HEAVN to black women who have already gone ahead, paving a path of resistance, resilience, and healing. Every song on this record is pure art, so I hesitate to name specifics lest you only listen to only one piece of the puzzle. Especially since you can stream or download the whole album for free from Soundcloud. Like most of Twitter, I was anticipating this record HARD. Blonde (spelled with masculine on the album cover and feminine in your digital music player) was the second album released in a matter of days, breaking his 4 year streak of silence. For those in need of refresher on the timeline, the visual album, Endless was released only for Apple Music first. It was relieving and beautiful, but when he surprised us with this second album, Blonde, it felt like summertime Christmas. Yet, while I’m happy to loudly defend any album on this list, I’d rather not talk about Blonde much at all, but just experience it alone, loudly over headphones. The album feels laced with subtle knowing glances and inside jokes, along with tornados of feelings and regrets. Frank manages to weave so many real-life tensions right in the music, as songs regularly referencing recreational drug use surround a lecture-interlude about the danger of drugs and alcohol, and descriptions of booty calls are directly before homages to Trayvon Martin – one of many young black men shot and killed by a cop. It’s these uneven, and at times, stream-of-consciousness transitions that make this album sound so very beautifully human. So many moments stop me in my tracks – “Pink & White,” “Nights,” “Solo,” and “Godspeed” are all regular reminders to keep your eyes open to the beauty and life around you, even in the pain and heartache. “Nikes,” is the only video released from this album so far, and just as a warning this is NSFW. To some extent I feel sorry for every other album released this year, because Lemonade is so much more than album of the year. It has been nothing less than iconic. For the third time now, Beyoncé has made what I was certain was the defining album of career; first with 4, then in 2011 with her self-titled visual/audial masterpiece, and yet somehow she managed to outdo her only real competition – herself! – with this beautiful masterpiece. With Lemonade we have stories within stories. At surface level, it continues the ongoing drama of Bey’s personal life with husband Jay Z. “Is he cheating on me?” is the question posed early on, and the guiding emotion of the first half of the record. While on one level this is a story of reconciliation between two people, every song seems to beckon more characters in to the narrative using both lyrics and genre. By time time we reach “Daddy Lessons,” we’ve heard the expected pop and R&B with some hip-hop nods, as well as straight up rock-and-roll in “Don’t Hurt Yourself,” when all of a sudden we get a deep-fried, New Orleans style, country song that asks us to consider not only Bey’s relationship with her husband, but also her relationship with her father. Suddenly it’s no longer just about a celebrity power couple, but reaches beyond them to the socio-political importance of all relationships within every community. It’s about the hard emotional work that all mothers and wives inevitably do, and particularly the burden that black women carry for the people they love. It’s about listening to one another’s stories and holding each other up. It’s about doing the personal inner work in order to “get in formation” and stay ready for whatever comes your way. It’s about taking whatever random tart fruit you’re given and making the absolute best damn summer beverage you possibly can. Even more than that, it’s about not taking some white fangirl’s word for it and paying attention for yourself. As many of you probably know (or could guess), I’ve been hosting mini “screenings” of Lemonade at my house about once a month since its release in May. I might get in trouble for making even a light comparison to The Holy Bible, but I think our reading of media like Lemonade is only made richer when we watch it with others. Each and every person I’ve watched the film with has provided new insights and questions. While I prefer to experience Blonde in private, it’s my belief that Lemonade is best when shared. As happy as I am with this list, I was forced to leave out some truly fantastic collections. Honourable mentions go to Kendrick Lamar’s Untitled, Unmastered, Anderson Paak’s Malibu, and Nao’s For All We Know. I’ve been also working on a list of 2016 songs that will purposely look at those not already featured on albums here, so check that out in about a week’s time. This year doesn’t seem to be getting any better, but I hope our collective reflecting and listening will prepare us for all the work left to do as we approach 2017. The Compilations bracket consists of soundtracks that are most like a modern day playlist. Each is a collection of songs, sometimes with a consistent genre or era, and other times brought together only by their connection to the story of the film they help to score. The other three brackets will be posted this weekend, and all the polls will be open for exactly one week. Please base your vote on the album as opposed to the film. For the most part, the images of the albums have links to places you can stream the soundtrack, although some are not complete versions. 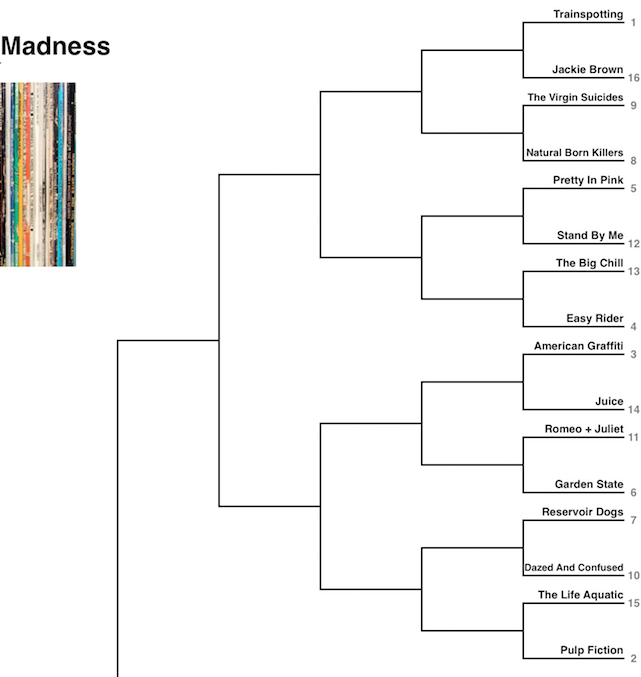 Also, you can check out the full brackets at March Madness: The Original Soundtrack. Have fun! The soundtrack for Trainspotting was so wildly successful that they released a volume 2, which is not being considered here. The album is incredibly eclectic yet somehow works, with Iggy Pop’s “Lust for Life” introducing us to a strange mix of melancholy alt rock, happy pop, energetic punk, and relaxed electronic beats. Meanwhile, one of Tarantino’s best soundtracks to possibly his most underrated film, Jackie Brown, intersperses some classic soul and funk with a bit of rap and some quotables from the film itself. Just as Shaft immediately conjures Shaft imagery, it’s very hard to hear some of this music without imagining Pam Grier as Jackie in all of her badass glory. Not to be confused with the original film score from the band Air, the soundtrack from The Virgin Suicides is given quite a bit of consistency with primarily 70’s folk/rock artists, with a bit of 90’s thrown in by Sloan and some of Air’s score. Natural Born Killers, on the other hand, is a massively eclectic work of chaos. Trent Reznor will show up plenty in these brackets, but here he is a producer, bringing together Leonard Cohen, Patti Smith, Dr. Dre, and Peter Gabriel and some ever popular film dialogue (soundtracks loved to do this in the 90’s). Both albums (and films) have a pretty high nostalgic value. Both were released in the mid-80’s, but Pretty in Pink’s New Wave soundtrack is nostalgic now that the 80’s are retro, and Stand By Me had nostalgia in mind from the beginning, as the film was told to us as a childhood memoir from the late 50’s. The soundtrack is quite frankly the best thing about 1983’s The Big Chill, and could just as easily be called a best-of-60’s-soul compilation. While The Big Chill looks back at the 60’s with longing nostalgia, Easy Rider is in the midst of 1969 with music that provides commentary on both the film’s story (of two bikers on their way to New Orleans), and the greater cultural climate of this important American era. Not to mention, this might be the earliest example of a true compilation soundtrack. Also known as 41 Original Hits from the Soundtrack of American Graffiti, this is truly an epic collection of 50-60’s pop music. To be fair, most of the songs are less than 3 minutes long. Juice may have a far more standard list of 14 tracks, but they are carefully chosen to present some of the absolute best of early 90’s rap and r&b. The only way it could be improved is by adding some Tupac, since he plays the lead role in the film. I think these two albums represent the most recent soundtracks I have been inspired to purchase, with the exception of a few other Baz Luhrman directed films. Appropriately, Romeo + Juliet has a great emotional mix of anger, sadness, hopeful peace, and ironic cheerfulness. Garden State is more subdued; it’s a bunch of indie anthems all chosen by Zach Braff, who also wrote, directed, and starred in the film. Something about his personal playlist seems to have spoken to a whole generation. The chronological first of many great soundtracks from Quentin Tarantino, and not the last we’ll see in these brackets. The soundtrack to Reservoir Dogs is set as though it’s a radio show, and provides a musical juxtaposition to to the story’s violence, which the album communicates through snippets of film dialogue. Dazed and Confused is a 1993 version of American Graffiti, with another epic soundtrack featuring the much more gritty classic rock from the 70’s and 80’s. At first glance it seems this might be one of the stranger match-ups. However, there are a fair amount of similarities between these two soundtracks: Both soundtracks have been commercially successful and critically acclaimed; they both include a decent amount of instrumentals; and both have themes relating to water, with the Life Aquatic’s Sven Libaek compositions, “Shark Attack” and “Open Sea” themes, and Pulp Fiction’s surf rock. They’re still pretty different, and how you choose between them is your call. Polls are now open for the Featured Artist brackets, so head over there if you haven’t voted yet! I have had so much difficulty in motivating myself to write about my 2008 rerun album this particular season, so I have decided to skip right to the album I chose for 2007 instead. 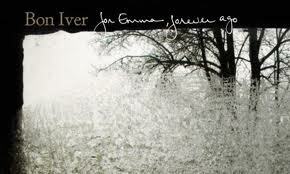 Along with Radiohead’s In Rainbows (which I gave the top spot in my top 12 albums of the ’00’s and wrote about here), there is no question in my mind that the album of 2007 I’m most likely to ‘re-run’ is Bon Iver’s debut For Emma, Forever Ago. Not only did For Emma shape what we would expect from Justin Vernon and the rest of the Bon Iver crew, it also seemed to speak directly to our hearts (especially of the broken variety) through barely-comprehensible lyrics and sparsely produced acoustic guitar. The truth is, we tend to love an album with a story, and this album has a particularly good one. Vernon had hit rock bottom with both his romantic relationship, and his band at the time. Carrying his grief and pain into solitude, he decided to process by moving to a secluded cabin to write, play, and record some songs. The result: an album of intimately expressed and beautifully written tracks full of atmospheric tension. The record begins with Flume, a song covered by none other than Peter Gabriel himself. See what you think of that, here. I’m not sure what I think about understanding all the words in this song, since part of what draws me into the raw emotionalism of Bon Iver’s music is the way his Vernon’s voice makes it hard to make out the english words. There is a sense that the only language that is clearly being spoken is that of music, and when a word or phrase does break in to my consciousness, it becomes especially meaningful. One of the clearest sounds in Flume is a muffled echo, reminding me that when grief is most poignant, sometimes nothing else sounds clear. Although Lump Sum begins with monkish motet-like harmonies, the song picks up with a faster pace, without losing the sadness that permeates the entire album. The echoey sounds continue in the harmonies, and the song fades perfectly into Skinny Love, arguably the most popular song from For Emma…, and for good reason, since few break-up songs are able to so honestly hold in tension such raw emotion with thoughtful reflection. The Wolves (Act I and II) slows down and emphasizes harmonies that remind me of Fleet Foxes. It moves from being nearly the sparsest track on the album, to being the most dense, complete with a horn section and chaotic drum set solo, and finally returning to the sparse voice and guitar feel it began with. I feel as though if I took a bit more time with this song, I would find all five stages of grief represented. Someone else can do that though. I’m moving on to my first love of this album: Blindsided. Just this listen through, I realized was how clear Vernon’s vocals are on Blindsided. It seems as though the only thing he can make sense of verbally is his feelings from being blindsided, and his continual reeling from the shock. Creature Fear and Team are two songs that carry the most volume and energy on For Emma, but instead of coming across as angry, they sound confused and desperate. Team is also the one lyric-less track on the album (though Vernon’s voice and whistle can still be heard), but I hardly notice this because of how Vernon treats his voice already like one of the instruments. For Emma seems as though he has moved to a point of considering closure. Don’t get me wrong; he’s still fairly bitter, (“Go find another lover… to string along”) but the relationship feels “forever ago”. My favourite part of this song are the horns. The strumming pattern gets old, but it does carry this sense of moving forward, one step at a time. If the album ended here, I think it would sound like a fabricated happy(ish) ending, but luckily it does not. Vernon ends with an “excavation” – Re:Stacks is a reflection that questions the entirety of his lost relationship. He plays with the metaphor of gambling in a way that is full of both sadness and hope. Hope, because there is a hint in the last line that the album itself is a part of the process towards moving on. He may have hit rock bottom, but he knew exactly where to channel that painful, chaotic energy: into an album that wrestles with his fears and griefs vulnerably and honestly. This is an album that I will return to, not only when I am at my worst, but perhaps especially when I am. I have to at least wonder how my experience of Come on! Feel the Illinoise! would change if I had ever stepped foot into the state of Illinois. 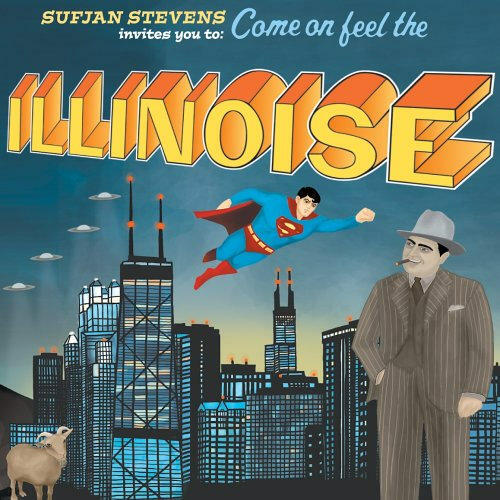 As Sufjan’s second installment of albums inspired by/dedicated to each of America’s 50 states (which is a project he’ll doubtfully complete), he references many specific locations, personalities, and events particularly relevant to Illinois, such as Chicago, Decator, Jacksonville, serial killer John Wayne Gacy Jr., Superman (he’s from Metropolis, duh! ), and those are just examples taken from the song titles. Not to mention, those are just ones that I actually recognize. But I don’t find the album’s American prairie setting excludes me completely as a west coast Canadian, because ultimately the album’s true concept is a collection of short stories of human life meshed with Stevens’ touching personal reflections. Just as a good movie can do, specific setting is used to create a fairly universal story. And story is one of the many things Illinoise does incredibly well; it is folk music at its absolute highest caliber. Although it is somewhat ambiguous from the first two tracks, Illinoise quickly shows itself to be the happiest sound on my list, and arguably the entire decade! Even tackling heavy subjects of war and murder, there is a lightness in the exquisitely eclectic instrumentation, and a sense of humor that comes with ridiculously long song titles. (For the purpose of time and space, I’ll use abbreviated names unless absolutely necessary). And so we are introduced to Illinois/Illinoise with reflective piano not constrained by any time signature used in pop music prior (65/16. And no, I don’t want to admit how long I spent on that), preparing us for a collection of songs that refuse to fit into any box. Flutes trill above the texture freely, until they go crazy in The Black Hawk War, a march complete with snare shots doubled by trumpets. While this album creates an atmosphere easy to play in any background, it can additionally be appreciated musically and lyrically for hours. For months I didn’t pay attention to what John Wayne Gacy Jr. was about, and when a friend pointed out that he was a famous serial killer I was eager to listen to the lyrics more closely. Sufjan has a way of empathizing with both victim and victimizer, turning the final line into an introspection: “and in my best behavior, I am really just like him, look beneath the floorboard for the secrets I have hid”. Jacksonville through Decatur (the first song I know of positively dedicated to step-mothers!) have a great southern banjo flavor that is only briefly interrupted by A Short Reprise of strings (which tie the entire album together, without sounding too formal) that flow straight into the best-known and loved track on the album, Chicago. Oh how I need to go to Chicago. In the past, I’ve mostly wanted to go so I could have my picture taken with the bronze Michael Jordan outside of the United Center. I still want to do that, but now I just want to duplicate an experience of a van road tripping and sleeping in parking lots like described in this song. More sensitive story telling with Casmir Pulaski Day, showing what has been consistently true of Illinoise; Sufjan’s beautiful sense of both melody and harmony. Having a brief instrumental break before The Man of Metropolis jars us back into interest with a few beats of an electric guitar that doesn’t find its way back into the track for a full two minutes. The variety in instrumentation is noted yet again, as The Prairie Fires return to a Sufjan-favoured combination of oboes and muted trumpets that finds itself displayed in all of its glory throughout the Predatory Wasp as well. And for the sake of trivia and awe, Sufjan himself plays nearly every instrument in the recording of this album. As Sufjan continues to sing his simple and deeply honest lyrics, it occurs to me that there is something about his voice that doesn’t quite fit in with the other artists on my top 12. Thus far it has seemed that one of the most consistent themes of Listmas has been men making use of their falsetto range. Think about it: Falsetto is practically a trademark for Justin Timberlake, Thom Yorke, Chris Martin, and Jonsi Birgusson. Yet Sufjan’s voice is under-produced, softly calling us to pay attention to his insights. Not that he never hits a high note, but there really is something quite noteworthy how unremarkable his voice really is. Yet we love him for it, and the way it seems to welcome us all to sing along with him. This album also plays rather like a movie. It’s certainly long enough to be a feature film, and as we near the end, tracks like Night Zombies and The Seer’s Tower turn dark, seemingly more at home on the earlier album Seven Swans, which is a musical interpretation of the Biblical Revelation. The ghostly part of the album doesn’t last long however, and we return to another 2 part-ed song full of energy and joy as though we really haven’t departed to far from the title track. Even the transitions between the two parts finds itself made up primarily of falling trumpet lines, while Illinoise transitioned by rising ones. In noticing similarities between Illinoise and The Tallest Man, I begin to wonder if the whole record is set up in a chiastic structure, since they match also as the third and third from last song on the album. This would make The Man of Metropolis Steals our Hearts the most important track through which to hear the rest of the songs. Interesting, but I’ll have to leave that analysis for another day, and instead try to remember whether Sufjan Stevens was in my Orchestration class as we also had to write an exercise of riffs using a single note. Either way, he cheats a bit. And so beautifully, Out of Egypt concludes the experience in a wonderfully Steve Reich influenced instrumental repetition that fluctuates slowly and covertly. It allows me to put the whole experience down for a while and reflect before I decide to pick this album up again. Sounds take their turns emerging and re-submerging into the texture as all that makes up Illinoise seems to be waving wide-eyed goodbyes. In a decade of emo and self-pity, Sufjan asks his questions of meaning not with naivety, but with refreshing hopefulness. Easily one of my favorite things created this decade, and absolutely my favorite new creative genius from these past 10 years.